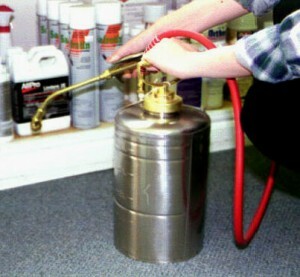 This is the 2 Gallon Professional B&G Stainless Steel sprayer so commonly known to be the choice of pest control operators. It features a stainless steel tank, an extenda ban drip valve (which has a cable running through the extension to the nozzle which insures quick, drip less on/off operation) and comes with the multtijet nozzle (two pin streams and two fan patterns). It comes standard with an 18″ valve extension but the 8″ is available at the same cost if required (most people like the longer extension since it will let you treat without having to reach down or up as much. Also, the 8 inch is a special or item so it will take longer to get). B&G has been making sprayers since the beginning of the pest control industry and this sprayer incorporates all the years of advancement and development in pump sprayer design. All parts of this sprayer are serviceable and we carry them all or can get them within a few days. Though not needed when doing most treatments around the home, this tool is essential to anyone doing any amount of pest control on a regular basis.